So last time we saw that in the month of October we had 11 fixtures (counting the Belgium match), but in the month of November we have eight! In the first three weeks no less! Not as great as 10, but close enough. 2018 World Cup qualifiers are in full force, and at the moment we are in the 2nd stage healthily at the top of the table. Our next opponents are Myanmar and Laos, and although our match vs Myanmar was a little lackluster, winning 2-0 thanks to some goalkeeping fails, our match vs Laos felt pretty good, winning 8-0 in the end. This time around let’s try to shoot for at least 12 goals to 0 conceded – wouldn’t it be cool to have a +26 goal difference in just 6 games? That would’ve never happened under say Choi Kang Hee or Hong Myung Bo. We have two new players called up – Yoon Young Sun of Seongnam, a CB Steve describes as “quality. Commands the backline & passes well, but slow footed,” and the goalkeeper Cho Hyun Woo, WHO PLAYS FOR MY HOMETOWN CLUB DAEGU FC, CURRENTLY AT THE TOP OF THE K LEAGUE CHALLENGE TABLE!! WOOHOO DAEGU! (My grandparent’s apartment is literally right next to the stadium they play in, but due to me being too busy I haven’t been back to Korea since 2008, currently my life’s biggest regret). 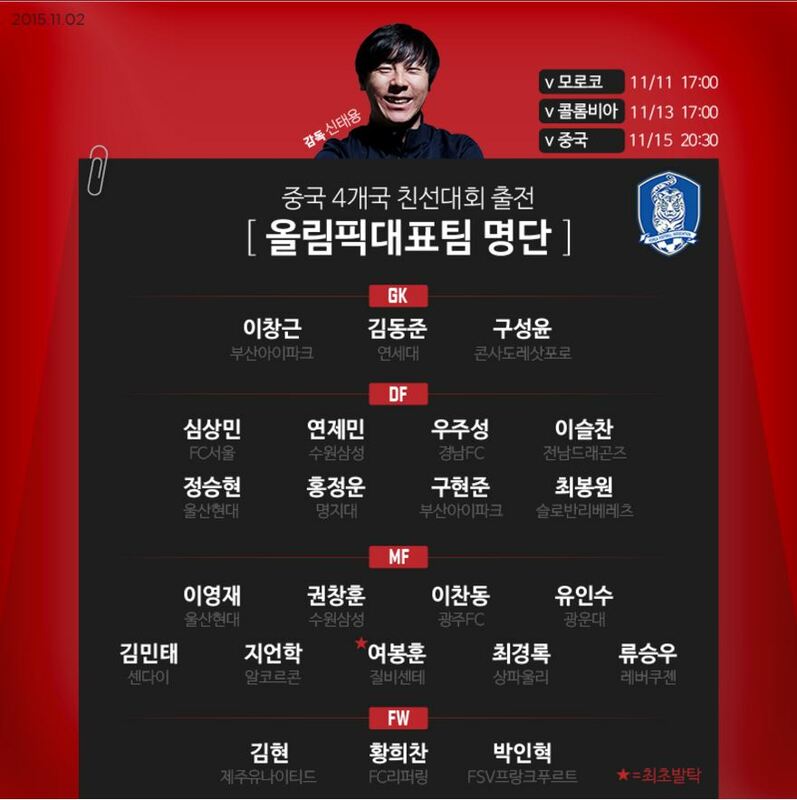 Anyway, speaking of goalkeepers, if you’re wondering why there are 4 keepers called up, it’s because Kim Seung Kyu has to leave the team to attend some military training thing. And regarding the defenders, it’s fairly standard, but the presence of only 1 natural right back (again) suggests that we’re going to use JHS as RB again. The forwards are straightforward and so are the midfielders. 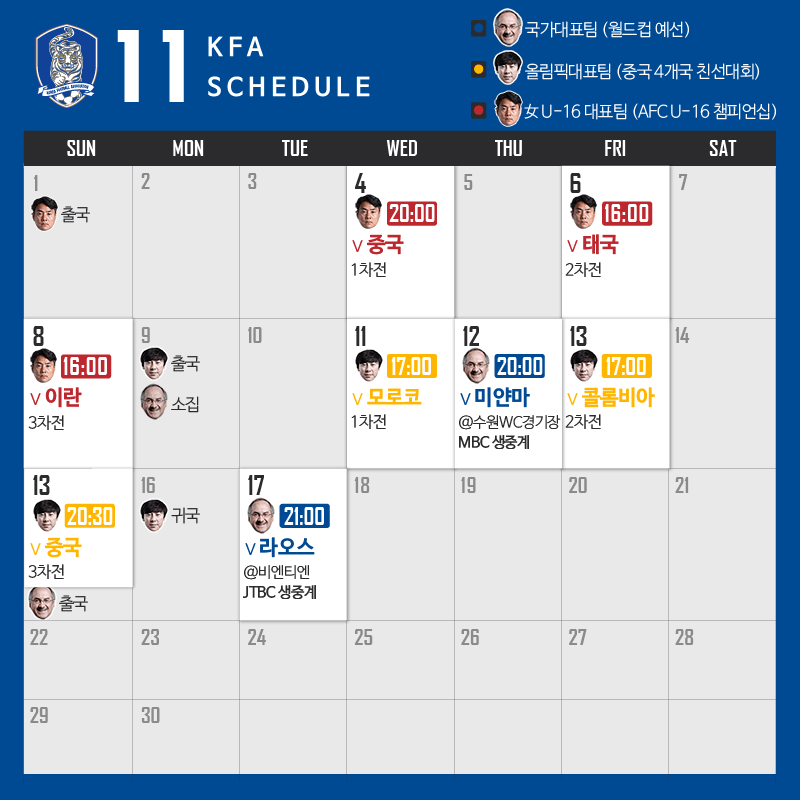 Of course right now our strongest options are SHJ and HEJ, and pretty much all our KPA were called up, in addition to the mainstay that is Lee Jae Sung, as well as the trio of Han Kook Young, Jung Woo Young, and Nam Tae Hee, the first and last of which I don’t believe are that deserving of a KNT callup. To be honest I would’ve called up Son Jun Ho and maybe Kim Seung Dae (since he’s been on fine form recently) but for some reason Son just can’t get a callup. We’re still missing the likes of Moon Chang Jin and Lee Chang Min, and promising young striker Cho Suk Jae still can’t get a callup, and Kim Seung Jun I guess didn’t get a callup since he isn’t playing all that regularly for Ulsan. But now Kwon Chang Hoon is back on the team, and it’s likely that from now on, the U23 team will take priority over the Senior A team if there’s overlap, due to the fact that the Olympics are coming up in less than a year. And HWANG HEE CHAN is back – get pumped, since this guy just scored a brace today to make a total goal tally of 9 in 13 games. 5 of those came from the last 3 games (so he went from 4 in 10 to 9 in 13 – his on fire right now!). The other callups are very expected. The ridiculously strong GK trio, the usual defenders, etc. Though I was slightly not expecting WOO JU SUNG to be called up – he was a started during the 2013 U20 World Cup either in CB or DM, but iirc he’s had a lengthy injury preventing him from playing too much for Gyeongnam. I don’t know if Woo Ju Sung will start right away; if he doesn’t, expect a starting backline of Sim Sang Min – Jung Seung Hyun – Yeon Je Min – Lee Seul Chan. And let me tell you I REALLY like that. Yeon Je Min is yet another CB captain who has high potential, just like Jang Hyun Soo and U17’s Lee Sang Min (dammit Jang why did you have to go to China). Now there is one new face, and it’s Yeo Bong Hun, who plays for the Portugese Divison 2 team Gil Vicente. He’s reportedly an AM, which, unfortunately, we’re all too stacked in. He’ll need to really impress if he wants to make the Olympic team. Now this is the tournament that will get our Women’s U16 team into the FIFA U17 World Cup, which by the way, we have won. We are in group A with China, Iran, and Thailand. I am still searching for the roster, but I’ll get it up as soon as possible. So. November is going to be a lot of fun. In October we won 10/11 and kept a clean sheet in 10/11 matches. So let’s hope November is just as successful!